My mother’s tradition of baking each weekend starting the Sunday after Thanksgiving is alive and well. After she passed on (many years ago) I took over the holiday baking for the family. The tradition is highly favored by the next generation. Pictured here are the annual cookie trays that I bring to school for the office and support staff. The family will begin their feasting on the 4th advent and will continue until all of the cookie trays and freezer bags are empty. 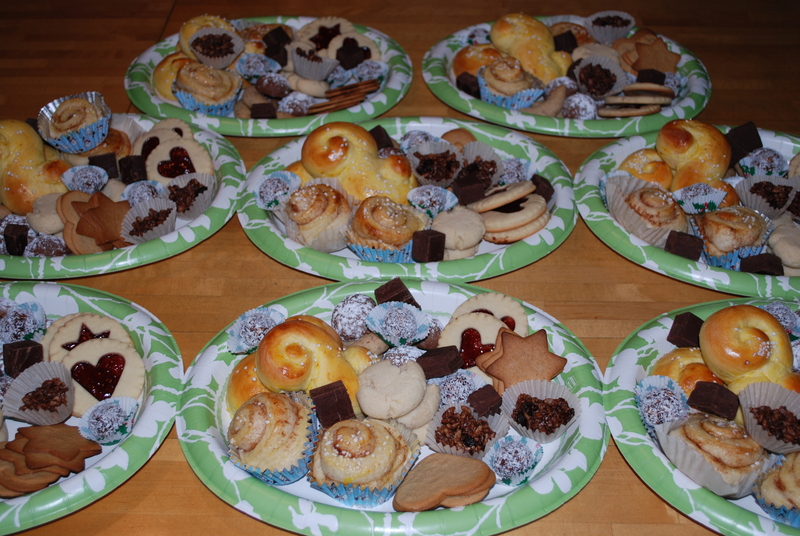 This entry was posted in Uncategorized and tagged Almond Crescents, Chocolate Snowballs, Chocolate Tops, Cinnamon Buns, Cocoa Balls, cookies, Drommar, Fudge, Ginger Snaps, holiday, Pepparkakor, Saffron rolls, Silhouette Cookies, swedish, trays on December 16, 2013 by lenapietri.